After focusing on early intervention with students in the city of St. Louis, speech pathologist Maggie Block is now providing individualized therapy for Edwardsville-area clients through her practice, Metro East Therapy Inc.
Block’s practice analyzes, investigates, addresses, treats and helps to prevent an array of disorders related to speech. These disorders exist anywhere within the realm of articulation, receptive and expressive language, voice, fluency, behavior or social language. “I truly love to work with the struggling reader, including individuals with dyslexia,” she said. In late 2015, the speech language pathologist sought expertise from the Illinois Metro East Small Business Development Center at Southern Illinois University Edwardsville. Although skilled as a pathologist, launching a business was a new experience for Block. SBDC Interim Director and Small Business Specialist Jo Ann DiMaggio May met with Block, helping Block fine-tune her business plan and connecting her with experts in the fields of law, accounting and more. May continued following up with Block to ensure she had the resources she needed to successfully launch her Edwardsville-based practice. Metro East Therapy sees clients from birth through age 18. The practice also offers group therapy and IQ and academic testing, along with parental education. Block’s clientele includes those with autism, learning disabilities, cognitive delays, physical limitations, articulation disorders, apraxia of speech, language disorders/delay, feeding difficulties, social communication difficulties, literacy challenges and fluency (stuttering) difficulties. Block has experience working with children who have sensory processing difficulties, ADHD, behavioral and social/emotional concerns. Block’s experience also includes supervising, teaching and preparing graduate students pursuing a career as a speech language pathologist at SIUE. For more information, visit metroeasttherapy.com. 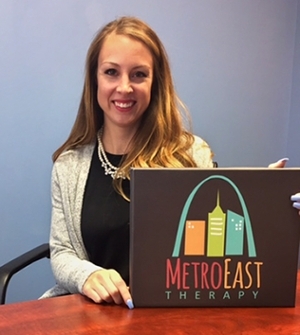 The Illinois SBDC at SIUE assists new businesses like Metro East Therapy Inc. and existing businesses headquartered in the nine-county Metro East region of Calhoun, Jersey, Madison, Bond, Clinton, St. Clair, Washington, Monroe and Randolph. It is a no-cost service to the community supported by the U.S. Small Business Administration, Illinois Department of Commerce & Economic Opportunity, and Southern Illinois University Edwardsville. Photo: Speech language pathologist Maggie Block is celebrating one year of providing speech and language pathology services at her practice, Metro East Therapy Inc., in Edwardsville.